Here's a brochure you don't see too often. 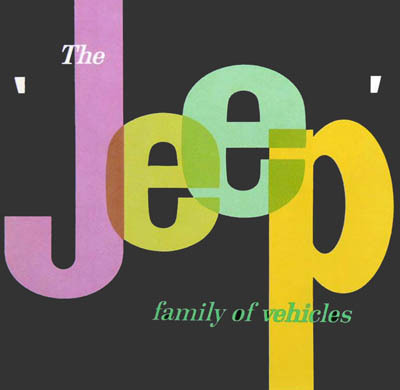 This 1961 publication has a number of unusual features, including a colorful and playful visual design, perhaps inspired by the unique 1959 brochures for the Jeep Gala. Maybe Willys was going after a more "hip" 1960s image, with some fun colors: a pink and green which approximate two of the paint colors used on the Surrey, plus Pepsi yellow to really make it "pop." 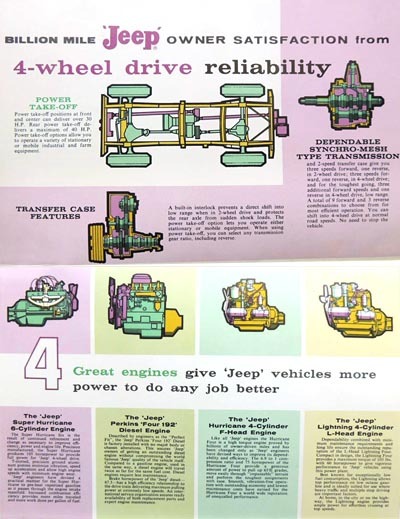 What is odd, is that this brochure is intended to promote the Jeep mainly as a working vehicle, not a fun vehicle. 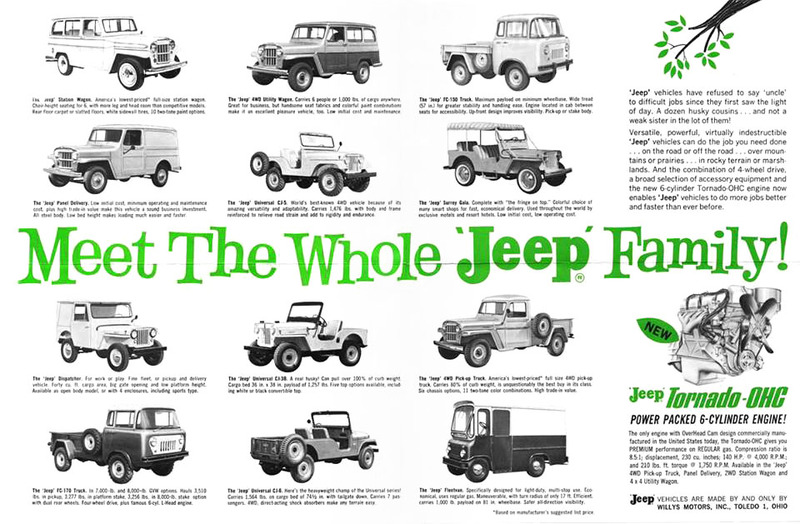 The images in the unfolded brochure all show Jeeps at work, with the exception of the first and last ones, which show two more responsibilities of the "working man": greeting his waiting family, and taking the family on vacation in a Surrey and a boat. The Surrey is called the "Surrey Gala" here, probably trying to erase some of the confusion over the two names used for the model -- "Surrey" in North America and "Gala" for the export version. 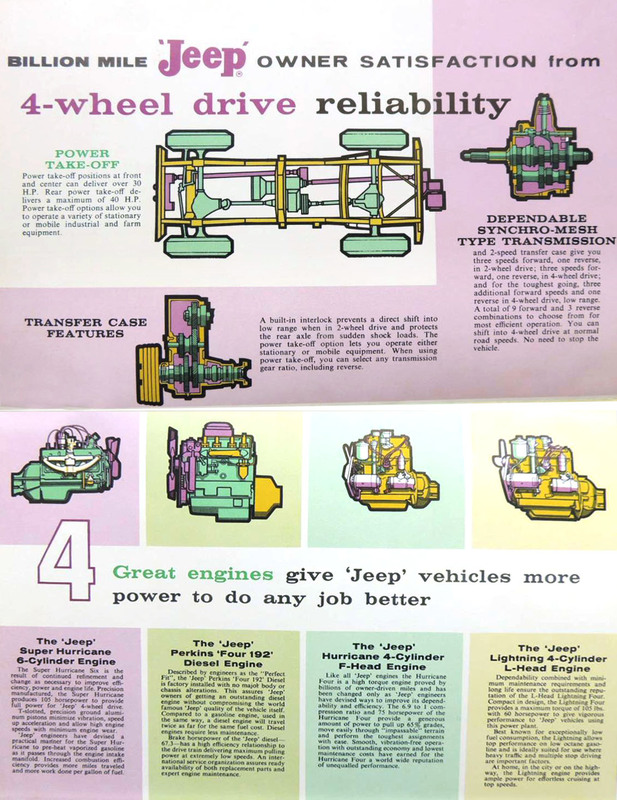 The other side of the unfolded sheet (right) has brief descriptions and diagrams of four-wheel drive, power take-off positions, and available engines including the Perkins diesel. These are also very colorful, possibly inspired by the Mitsubishi Jeep brochures being produced in Japan. Something else unusual about Form 61-7 is the prominence of the CJ-3B. 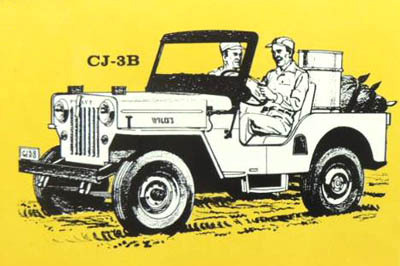 The sketch of the oldest and most basic Jeep Universal is actually larger than the CJ-5 and CJ-6! 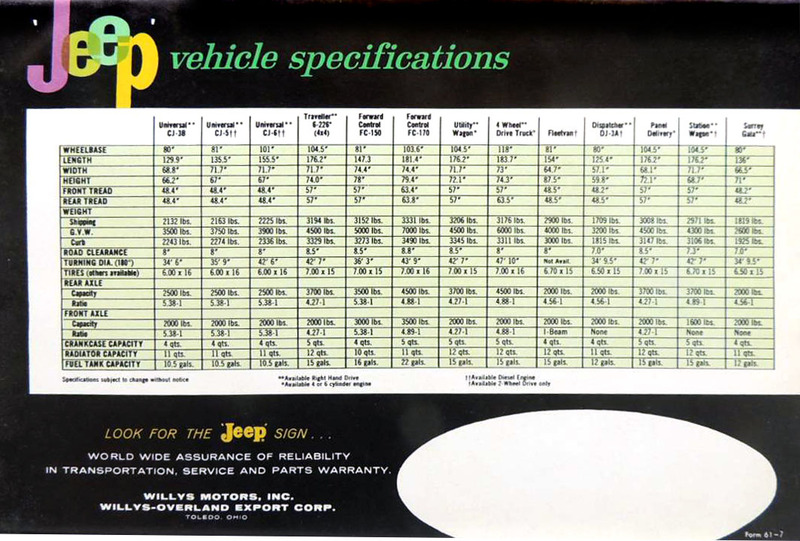 Sales of the 3B had been dropping through the late 1950s, and Willys reversed that trend in the early 60's by promoting exports and fleet sales. When the brochure is folded, the back page is a summary of specifications for all the Jeep vehicles illustrated. At the bottom, the Willys-Overland Export Corp. name is shown, as well as Willys Motors Inc., and there is a space for a dealer's stamp. The brochure is also identified as Form 61-7. 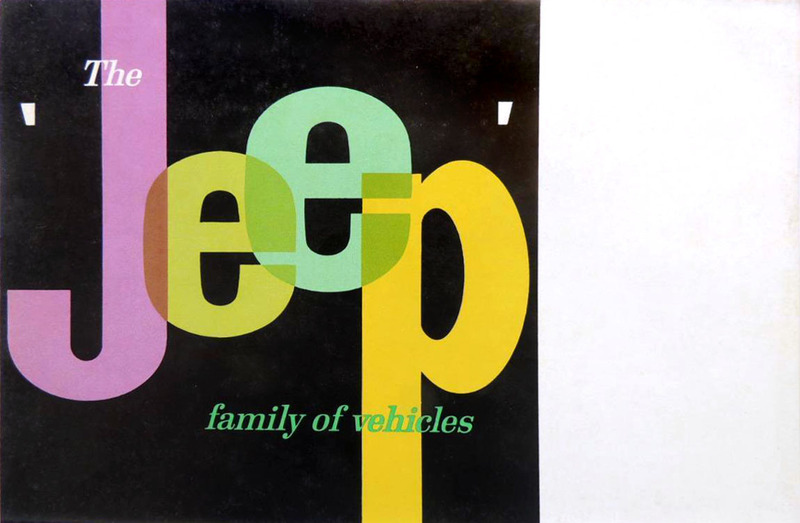 There was also a brochure titled Meet the Whole Jeep Family (160K JPEG). 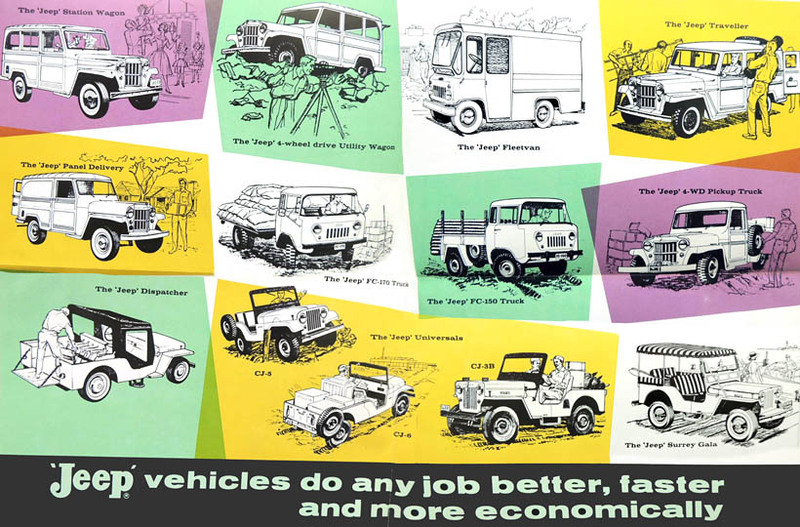 See more CJ-3B Advertising and Literature.